We are counted among the foremost Die cast Lubricants Exporters, Manufacturers and Suppliers In India. We offer a variety of Die Cast Lubricants like Water-Based Lubricants, Oil Base Die Lubricants, Oil Base Piston Lubricants and Water Base Piston Lubricants. Our Die Casting Lubricants are available in different grades in order to meet the different demands of the clients. Our Die Casting Lubricants are used to provide proper finishing to the alloys. Each grade has its special feature to suit the different requirements. Our Die Casting Lubricants augment the overall steadiness of the castings. 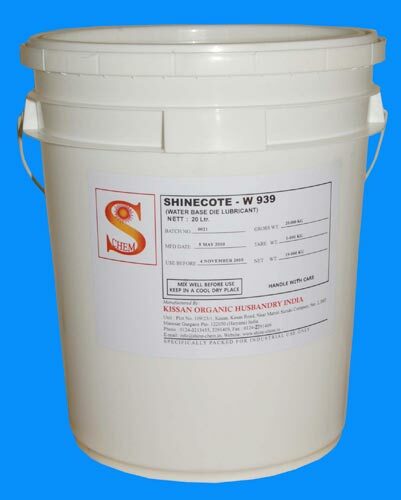 SHINECOTE W 3775 : High performance bright casting die dressing for thick section Al alloys.